If you "just miss" a green light, are you more likely to catch up later? The answer probably varies based on traffic light synchronization, distribution, etc. Suppose there are 15 signals on your trip, and you "just miss" the first green by a few seconds. Are you more likely to catch up at a future red as traffic is stopped, or would you be more likely to miss another one and fall further behind? Re: If you "just miss" a green light, are you more likely to catch up later? Fort Smith says they are going to synchronize their signals this year, which will mean fewer redlights for drivers. Currently, it's a roll of the dice if you'll catch the succeeding greens or not. So overall it depends, as you said, on synchronization and distribution. tradephoric would be the man to answer this question. In Illinois, it's typically a crapshoot with the way they love actuated signals here. Along a perfect coordinated stretch of road (like Woodward Avenue in Detroit), if you "just miss" a green light it means you will never be able to catch up to that green wave you just lost. In light traffic conditions i like traveling near the end of the green wave because i can cruise a little over the speed limit and slowly catch up to the start of the green wave over several miles. However, once you get closer to the start of the green wave, you really have to watch your speed and travel at the exact speed the signals are timed for (ie. usually the posted speed limit). In my experience it's a fun challenge and to an extent more "art" than "science" (how one engineer prefers things vs another). I think you'd like to look up "time space diagrams"
Woodward Avenue is the birthplace of the modern traffic signal. The first 4-way traffic signal tower in the world was installed at the corner of Woodward and Michigan Avenue in October, 1920. 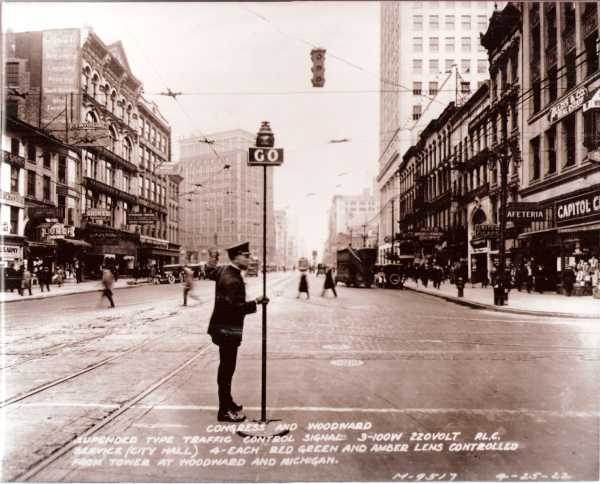 By December 1920, additional signals were added along Woodward at Grand River, State, Fort, and Congress. These additional signals were all connected to the main signal tower at Woodward and Michigan Avenue and manually controlled by a police officer sitting in the tower. This was essentially the first inter-connected traffic signal corridor in the world. Nearly 100 years later they have definitely kept good signal progression along Woodward avenue. 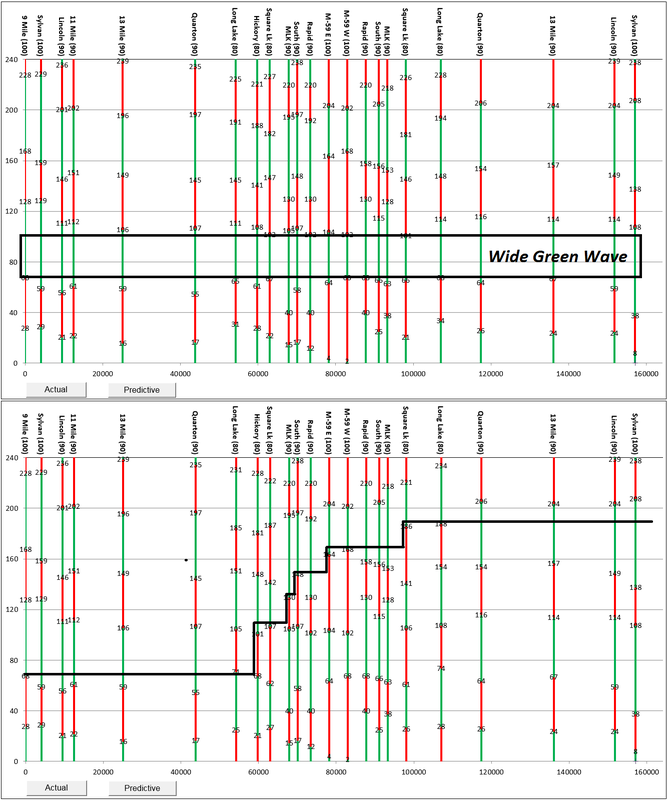 Usually innovation is improved upon, but the first ever corridor with connected traffic signals still appears to be the best in regards to signal progression. Drive for 40 miles, hit 124 consecutive green lights, and not get stopped. I must be missing the joke, unless what you're saying is actually true. ^Just that I'm obviously into coordination and signals. Guy's standing there holding up a stop/go paddle sign in 1920 along the first ever coordinated stretch of roadway.... kind of kindred spirits you could say. I think your first sentence answers the question, and another factor I'd add is that the time of day can make a difference if the light timing varies. I can think of some lights in DC where at night (say, after hockey games) you can get through them right at the end of the cycle but during the day you can seemingly get through them only at the beginning of the cycle. Of course, I think the biggest factor is other drivers. All it takes is one person in the way going the wrong speed and, if there is traffic in the other lanes preventing you from getting over, you get stuck. I swear the elevator system in my building is hooked up to the traffic light outside. Cause everyone I leave and go outside, the direction I need to cross the street turns red!! Signal progression along a corridor can change on a cycle by cycle basis, even as the underlying timing of each individual signal remains constant. This is because there can be breaks in coordination along a corridor (due to geometry change, speed limit changes, traffic demands, etc.). So while Woodward Avenue definitely has great signal progression, there is in fact only 2 or 3 cycles per hour where you could replicate that drive i posted above.... and to do so you need to be able to predict the Signal Phase and Time along the corridor (SPAT data). 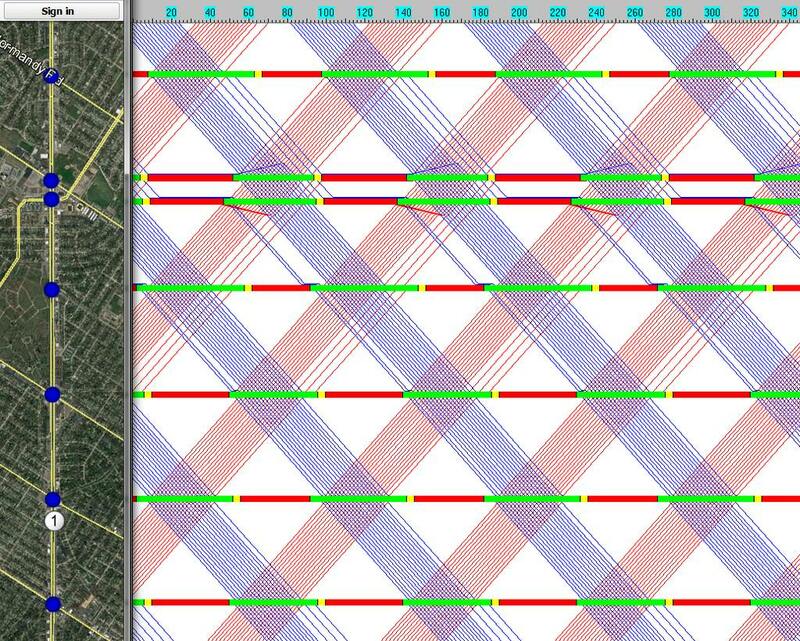 Here's a quick and dirty graph showing SPAT data along Woodward Avenue. If you leave the 'wrong cycle', you may get stopped as many as 5 times during that 40 mile stretch (still not bad). But if you leave during one of those few perfect cycles, then you can cruise 40 miles without stopping. But only if drivers are given this SPAT data will they know if their run is going to be good or not. Well the only thing with that is that Woodward is not 40 miles long and the green wave on Woodward is between 9 Mile and Pontiac. Woodward is only about 25 miles long btw. I have observed in the past that if you stop at a red light heading southbound at this intersection (CT 137/High Ridge Rd and Interlaken Rd), you are pretty much guaranteed to also stop at a red light at the following intersection with Scofieldtown Rd (see? It even happened to the Street View car!). I don't know why those lights are timed like this - maybe ConnDOT made no effort to deliberately coordinate them and it just worked out that way... or maybe they were supposed to be coordinated but the timing of one of the signals got skewed and it's never been corrected. I do know the signal at Interlaken has only been there for about 20 years (it was a flasher prior to that); the signal at Scofieldtown is older. Not nearly as much as they love them in GA.
Usually it's a crapshoot what phase you're going to get next. Every signal in my area has a pre-emption system and their cycles change depending on time of day. The only timed-only signals left near here are in Hartford. Here, they're all on sensors. Some towns are dodos birds and stick with timers. Mainly towns with old installations. Lots of setups on the Cape are timers only, for example. There are no sensors along Woodward Avenue and it just runs fixed time. You don’t need state of the art adaptive signals if you have good geometry. Much of Woodward Avenue runs 90 second cycles all day and night… a cycle that achieves near perfect dual progression along the corridor. And it's a long enough cycle to maximize capacity during rush hour along the 2-phase signals yet short enough where people at 2AM aren’t complaining about long reds. Note that "preemption" is common on many traffic signals and has nothing to do with the signal timing or phasing. Preemption is what happens when a signal's normal operating cycle is overridden by some other event, such as changing to green for the direction of an emergency vehicle, or changing to all-way red flash due to a train coming on an adjacent railroad track. You might be thinking of "detection" instead, which senses when vehicles are coming and (depending on the signal controller's programming) changes the signal phases to accommodate. Your chances of making the next green light go down considerably (perhaps down to zero, as trade indicates). So, to answer the OP, not likely. 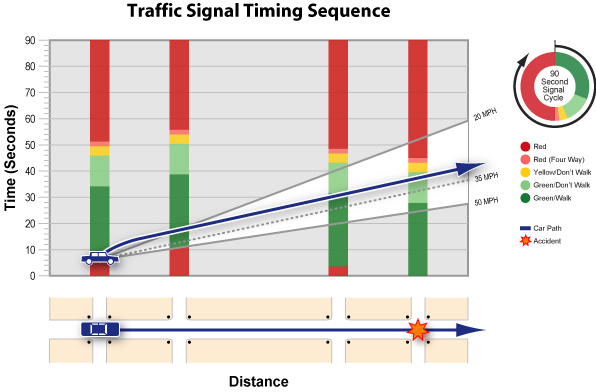 Even in non-timed environments, where signals use detection, it helps to drive as part of a pack, as a line of cars will keep a light green until an unknown maximum green time is reached. One of my pet-peeves is when drivers fall behind, creating a gap just large enough for the signal to "time"-out. Because of this, as a driver, I always consider it my job to keep up with traffic, regardless of the limit. The signal controller setting for this is the "Passage Gap", which is a countdown timer tied to the upstream vehicle detectors—after the initial green time, the passage gap timer starts counting down, but resets every time a vehicle is detected upstream. If the passage gap timer reaches zero prior to the maximum green time, the signal turns yellow early—this is often referred to by signal engineers as "gap out" or "gapping out". Thanks for the explanation. Never knew how that worked. The timer seems to be set around 1.5 to 2 seconds at most lights in my area (with the initial green time at most signals around 3 seconds). Re: If you &quot;just miss&quot; a green light, are you more likely to catch up later? It varies depending on upstream detector placement and assumed roadway speed/speed limit, but I believe 2 seconds is a pretty common value for passage gap.